With its 21mm orbit and 150mm/6″ backing plate, the LHR21 Mark III random orbital polisher is the perfect choice for working large surface areas and “panel-off” work. 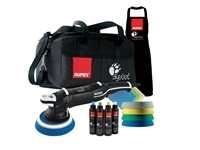 It produces results quickly, without neglecting the RUPES branded quality and comfort. The ultra-efficient motor guarantees more power and torque on every surface. The new iBrid manufacturing concept will increase process efficiency and optimize the user experience. The functionality of a battery and the option of corded electric supply, all without interruption of the task at hand. With its 21mm orbit and 150mm/6″ backing plate, the LHR21 Mark III random orbital polisher is the perfect choice for working large surface areas and “panel-off” work. 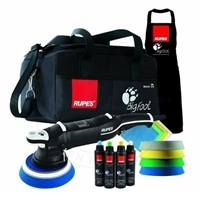 It produces results quickly, without neglecting the RUPES branded quality and comfort. The ultra-efficient motor guarantees more power and torque on every surface. 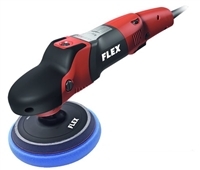 The FLEX XFE7-15 150 Long Stroke Orbital Polisher ("The Finisher") is a free-spinning, dual action polisher that embodies everything that is “FLEX”. The FLEX XFE7-15 Long Stroke Orbital Polisher has a 15 mm stroke length to cover more area and help you breeze through a detail. Features extra cooling vents to prevent overheating, and a more streamlined, ergonomically correct body, along with the massive throw. The new POLISHFLEX was developed by professionals for professionals. Motor and gear unit both operate extremely quiet. The optimum speed range of 600-2100RPM and the high torque are ideal for treating a variety of surfaces. The ergonomic design and low weight make it easy to reach and prepare even problematical spots. The maximum polishing pad diameter is 200mm enabling horizontal and vertical surfaces to be quickly and comfortably treated. The LHR 75E is the polisher for difficult shapes and for spot repair operations. The LHR 75E is a must for any detailer wishing to obtain perfect results, even in the most difficult areas. The BIGFOOT family of tools and bridging the gap between rotary and free spinning orbital polishers the Mille provides a balance of power, ergonomics, and capability for operators who crave a gear driven solution. Built to handle almost any detailing situation, the LHR 15 Mark III is the ultimate choice for detailing professionals who seek a balance of power and maneuverability. The ergonomic design allows for precise paint correction with complete comfort, including curved surfaces. The powerful motor delivers peak performance in the optimal OPM range and ideal performance through the entire speed range with the addition of a progressive trigger and retuned speed control. The small, compact tool is the ideal complement to larger polishers. Perfect for spot repairs. It can be used for a large number of applications when working with difficult shapes. 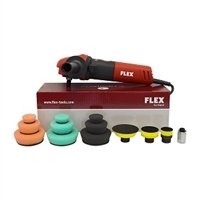 This Flex PE8 Mini Rotary Polisher Kit comes with a total of 9 pads and 3 backing plates. By using these pads, you will be able to conform to curves and tight body lines in vehicles, making it so every last angle of the vehicle is detailed to perfection. 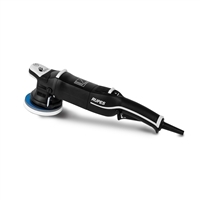 This 3" lightweight, rotary polisher is great for the fine detailing and for those small, hard to reach areas on marine, auto and motorcycles. The LHR 75E is the polisher for difficult shapes and for spot repair operations. The LHR 75E is a must for any detailer wishing to obtain perfect results, even in the most difficult areas. Slim stick handle, high torque motor, light weight, and a practical bail handle. That is how to polish easily and effortlessly in every job. The accelerator trigger switch and speed selection allow for a controlled acceleration to the optimal mixing speed. The 6mm Skorpio III pneumatic dual-action palm sander provides a perfect balance between fast material removal, user comfort, and control. It is RUPES’ most popular dual-action palm sander. All Skorpio III sanders feature engineered motors designed to maximize torque, even with low or inconsistent airflow. Heavy Duty 7" to 9" Polisher and Sander is built to be powerful and effective while it is under load from its' variable speed of 1,000 to 3,000 RPM. The heat-treated precision cut gears protect the life of the polisher. High efficiency motor with high torque delivered, unique design and ergonomic control lever for a safe and comfortable handling. On board service spanner for a quick tool servicing, Swiveling air outlet silencer designed for low noise level with no performance losses. Makita’s 7 in. Electronic Polisher-Sander is a favorite among automotive and marine enthusiasts for polishing and sanding. The 9227CX3 combines 10-amp power and variable speed control. Heavy Duty 7" to 9" Polisher and Sander is built to be powerful and effective while it is under load from its' variable speed of 1,000 to 3,500 RPM. The heat-treated precision cut gears protect the life of the polisher. Makita’s 7 in. Electronic Polisher-Sander is a favorite among automotive and marine enthusiasts for polishing and sanding. 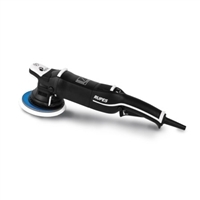 The 9227C combines 10-amp power and variable speed control The BioTech Dual Action polisher provides the finesse needed to create a mirror-like finish, and the power to cut through the toughest paint imperfections. Variable Speed Buffing/Polishing/Waxing/Sander Machine 7"
The Porter-Cable 6-inch Variable-Speed Polisher is ideal for polishing and sanding automotive/truck, airplanes and marine projects. This sander incorporates an electronic variable-speed dial The Porter-Cable 6-inch polisher is ideal for polishing and sanding automotive/truck, airplanes and marine projects. Swirl-free sanding/polishing action with an electronic variable-speed dial Our BioTech Variable Polisher and waxing machine comes with a backing plate included.